Just a few months after the state's largest wind farm started spinning electrical power on Maui, its owners are considering doubling it in size. In June, Kaheawa Wind Power began operating 20 wind turbines that can generate up to 30 megawatts of electricity on the windy slopes above Maalaea Harbor. Now the company is asking the state Board of Land and Natural Resources for a lease on a 325-acre parcel of state land immediately west of the 200-acre parcel it currently occupies. 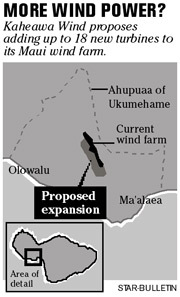 The Land Division of the state Department of Land and Natural Resources recommends that the board "approve in principle" negotiating a lease with Kaheawa Wind, contingent on the company meeting permitting and environmental regulations, having a power-purchase contract with Maui Electric Co. and securing financing. Approving the Land Division's proposal wouldn't mean the board is endorsing the project, according to materials submitted for the board's Friday meeting. » Whether the company should have applied for the total number of wind turbines all at once. » Whether 38 turbines would be the final project, or more could be added in the future. » How the state can assess the environmental impact of adding turbines, when not all the work on the first 20 is complete. » Whether adding turbines will cause view pollution from the Lahaina Pali Trail. Unresolved problems with the first 20 turbines include the introduction of an invasive plant, bare land that is eroding and questions about the project's effect on area birds and plants, wildlife biologist Fern Duvall II said in written comments. Kaheawa also needs to address removal of construction debris and comply with all state and federal environmental protection laws relevant to the expansion project, wrote Paul Conry, Division of Forestry and Wildlife administrator, in his comments. Kaheawa officials couldn't be reached for comment yesterday. Maui Electric Co. President Ed Reinhardt confirmed that the utility is assessing whether it would be interested in buying more wind power from Kaheawa. Reinhardt couldn't say how long that assessment would take. He said Maui Electric had not determined the maximum amount of wind power -- which is not available all the time -- it could include among its power sources. Recent brush fires in the area threatened the new wind farm, but didn't damage it.